As the seasons change and the months pass, a person can’t help but savor cooler nights with fragrant, steaming meals, and the promise of the holidays soon to come. 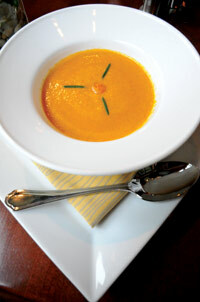 Sungold Tomato and Rosemary Soup—See recipe from Executive Chef Peter Schott of The Lodge at Woodloch. The Rosemary Herbal Wrap—See step-by-step how-to from The Spa at the Sporting Club in San Diego. Many professional skin care and spa products also feature the benefits of rosemary. Youngblood Mineral Cosmetics’ Restore from the Minerals in the Mist collection features a replenishing blend of rosemary, grapefruit and lime infused with minerals and vitamins for long-lasting hydration and protection. Yon-Ka Paris’ Phyto 152 helps reduce the marks of pregnancy, preserve youthful curves and refresh tired legs with a rosemary elixir concentrate. Sothys’ Beauty Garden Range featuring the EcoCert organic label includes Comfort Mask and Gentle Face Care with helianthus and rosemary. Terra Dolce: The Esthetician’s Garden’s Rosemary Garden Body Butter hydrates and tones skin using top quality rosemary essential oil. CA Botana’s Ambrosia Aromatherapy Rosemary Camphor Mask cools and invigorates using rosemary to normalize oily, blemished, congested skin. Dr.Hauschka Skin Care’s Rosemary Bath includes rosemary essential oil to energize skin and help reduce the appearance of cellulite. Rosemary serves as a potent reminder of nature’s wonder, with its ability to bring out the best in food, spa treatments and skin care products. Try incorporating rosemary this winter into your healthy, beneficial and sensuous spa treatment menu and support your rosemary services by providing rosemary-based professional skin care products in your retail area to allow clients to bring the experience home. 1. Toss 1 tablespoon of olive oil with tomatoes, then place tomatoes on a baking sheet sprayed with nonstick cooking spray. 2. Roast tomatoes in preheated oven at 350°F for 20 minutes. 3. While the tomatoes are roasting, add remaining tablespoon of olive oil in a four-quart saucepan and turn the heat to medium. 4. Add onion, celery and carrots, and cook until soft. 5. When tomatoes are ready, scrape all of the tomatoes and remaining juices, along with garlic and vegetable stock, into the saucepan with the vegetables and simmer soup for 20 minutes. 6. Next, add the rosemary and use a blender to purée the soup, then season with salt and pepper. Restore the skin’s vitality and balance with this botanical mask, leaving the skin silky smooth with its aromatic rosemary formula. Place towels on massage table on top of mylar and thermal blankets. Step 1: Add drops of rosemary essential oil to wet towels and place towels in hot cabinet. Put volcanic clay mask, scalp massage oil and rosemary lotion into three separate bowls, and also place in hot cabinet. Step 2: Greet the client and describe the treatment in detail. Discuss the client’s health history and remind her that clients who are pregnant or claustrophobic should avoid this treatment. Step 3: Guide the client to treatment room and ask her to remove her robe and lie face down on the treatment table. Leave the room momentarily for privacy. Step 4: When starting the service, apply warm volcanic clay mask on client’s body, starting at the feet and moving upward. Step 5: Ask the client to turn over onto her back, draping with the blanket for privacy, and repeat Step 4 on the front of the body. Step 6: Drape the client in warm towels, help her sit up and put another warm towel under her back, then have her lie back down. Step 7: Wrap client in mylar and thermal blankets, and conduct a scalp massage with warm scalp massage oil for 10 minutes. Step 9: Direct the client toward the shower to remove the mask and ask her to return to the treatment room when ready. Step 10: When the client returns, complete the treatment with a 10-minute massage using warm rosemary lotion.